What Is A Crown Or A Bridge? 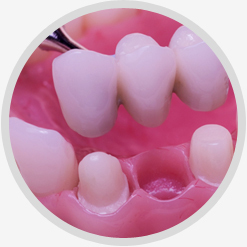 A crown or bridge is a prosthetic cemented onto the remaining tooth structure to replace missing teeth structure in the case of a crown, or an entire tooth in the case of a bridge. Crowns and bridges can often become loose or fall off. Sometimes the cement bond used to cement on the crown or bridge fails and the crown or bridge becomes unstable. 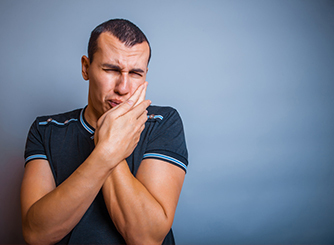 Habits such as bruxism, grinding, or eating sticky candies or foods, as well as trauma, can also break the cement bond. Each day the teeth are subjected to heavy biting or mastication forces. If the crown or bridge comes right off then the exposed tooth structure may become very temperature-sensitive as the nerve in the teeth becomes stimulated. Potential causes of broken crowns or bridges include improper cementation, inadequate preparation or retention, or physical trauma. What Should The Patient Do If Crown Is Broken or Comes Loose? It can be very disturbing and cause some anxiety when a crown or bridge becomes loose or falls off. If the crown or bridge becomes unstable but has not come off yet, then the patient should avoid eating out if possible and see the dentist as soon as possible. If the crown or bridge has come off, it should be secured in a safe place, and the patient should arrange to see the dentist as soon as possible as well. Even temporary crowns or bridges should be replaced as soon as possible in order to protect the underlying tooth structure and avoid shifting of adjacent or opposing dentition. Temporary cementation kits are not a permanent solution, but are available and should be used only as a last resort if no dentist is available. If the patient believes that they may have aspirated the crown or bridge, then a visit to the hospital emergency room is recommended for an x-ray. Recurrent decay may also occur. Implant-supported crowns or bridges which become loose may not be from the cement bond that failed but instead from more complicated reasons such as an abutment screw loosening. This can be determined by your dentist after a proper examination and x-ray. If the abutment screw is loose, then it may resume tightly and perhaps no recementation of the loose crown or bridge will be required. Sometimes after a loose crown or bridge is removed, it may be replaced and is not salvageable.